"Think about others who are not as fortunate as you and just realize that we depend on these spots." LOCKPORT, La. -- Danielle Gaubert and Andrea Gouaux grew up together in Lockport, La. As kids, they played softball together and splashed through the water in Grand Isle. As adults, they share tragedy. 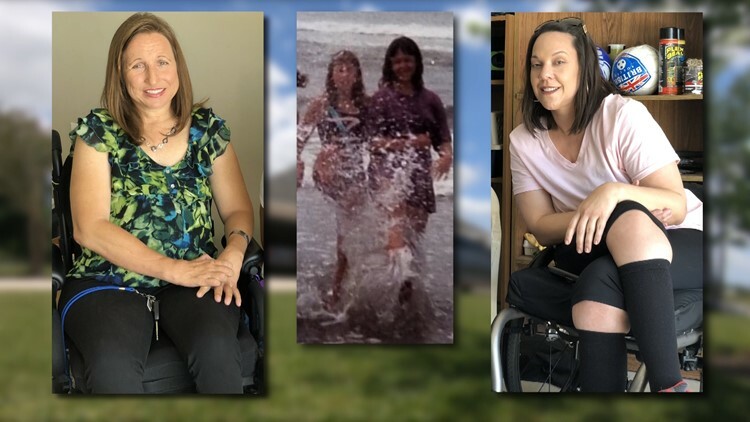 Gaubert was severely injured in a car accident 27 years ago. The crash killed her boyfriend and left Gaubert paralyzed from the chest down. "My hands are affected. You can see how they're ... ugly," Danielle Gaubert said. "And I can't move my legs. I can't stand up or anything." Andrea Gouaux's ability to stand and walk was taken away four years ago. "It's just very hard to get used to. Coming from being very independent," Andrea Gouaux said. It happened during a deadly shooting rampage. Her sister's ex-husband, 38-year-old Ben Freeman, shot Gouaux, along with members of her family before killing himself. Gouaux survived, but her mother did not. Both women, who once knew life unbounded, now face similar obstacles. "People don't think about, how do you do this and how do you do that?" Gouaux said. "How do you wash your clothes? And how do you get in and out of your house?" What's heartbreaking, Gaubert says, is when she finally arrives at her destination and sees cars parked in handicapped spots. Last month she noticed a truck parked in the blue lines section when Gaubert visited the Audubon Zoo. The blue lines are meant for residents like Gaubert, who need to use a ramp to get out of their vehicle. Last month, Gaubert says she pulled into a Dollar General and noticed racks of items taking up the blue lines section. Some drivers, Gaubert claims park boldly in handicapped spots without a noticeable placard or hang tag. "A lot of times (drivers) say, 'Oh, we were just running in for something.' You know what, you're taking my spot! You shouldn't!" Gaubert said. 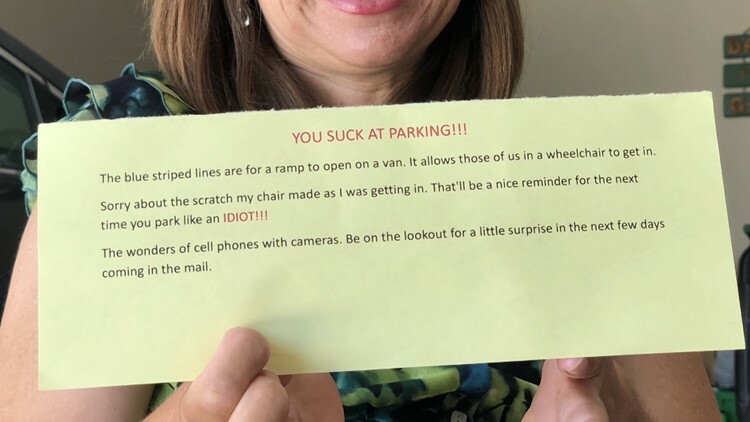 Since her accident, Gaubert says she's come to terms with her life in a motorized wheelchair, but seeing able-bodied drivers take spots for their convenience aggravates her. Handicap parking abuse is not just affecting them in Lockport. This March in New Orleans, the Inspector General's Office released their annual report showing 26 employees used unauthorized handicapped placards to park for free in metered spots around the Sewerage and Water Board headquarters, costing the city $197,000 in revenue and leaving those in need of the spot without a place to park. Not long after our first report, the man who filed the complaint says he noticed the same cars still using the placards. Eyewitness News caught up with employees who had placards on their vehicles, looking for an explanation. Instead, many of them hid their faces, ignoring our questions before driving off. "The conduct of the employees, the number of employees involved in the scam, and the reaction of the S&WB to this fraud is outrageous. How can the S&WB claim detecting, preventing, and monitoring applicable local laws and then turn its head the other way when an egregious violation such as this one is committed? The agency's cavalier attitude toward waste and fraud must be immediately corrected." Susan Myers is the Director for Policy & Community Engagement at the Advocacy Center of Louisiana. "I know people would say this is not a priority or high on the list of things to do, but this is a really fundamental way that people with disabilities have access to their communities," Myers said. Myers wants to see strict enforcement take place in all municipalities. "Whether it's high on the priority list of law enforcement, I would like to think as citizens we would all be responsible enough to do the right thing, and not abuse the privileges that some people actually do need," Myers said. Gouaux and Gaubert say they're not looking for sympathy or tears. They just want those who continue using these spots and tags illegally to see their story, and wake up. "Think about others who are not as fortunate as you and just realize that we depend on these spots," Gaubert said. Given how life drastically changes in a heartbeat, you never know if you or someone you love could be the next person relying on a handicapped spot to get around.